Today is June 1, and the official start of hurricane season on the Atlantic Coast. 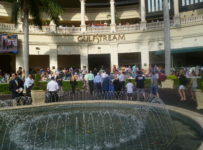 But the month is off to a sunny and “no worries” kind of start at Gulfstream Park, where first post is 1:15 p.m. for an eight-race card. 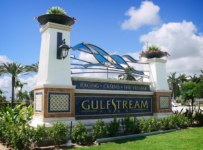 According to the Weather Channel, there is just a 15 percent chance of rain during racing hours in Hallandale Beach, where Gulfstream is located. We will have afternoon coverage on our blog. 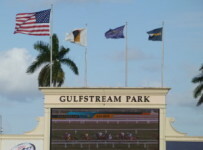 The rail is at 96 feet, the same as for the third and sixth races. 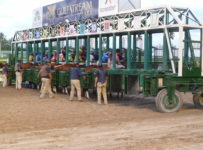 The rail is 24 feet for the second, fourth and eighth races. 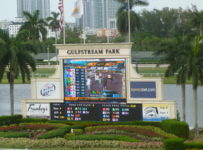 The class-dropping Concert Stage has the rail, which has been favorable in recent weeks, and is the likely favorite in the seven-horse field. Tyler Gaffalione has the mount for trainer Gustavo Delgado. It might be wise to include Thinkinquality in exactas and trifectas. 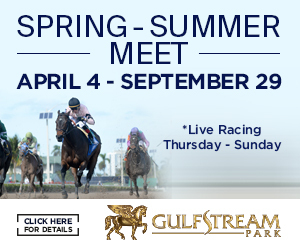 Thinkinquality is coming off a win at 1 1/16 miles on turf (rail at 108 feet) in a $12,500 claimer at Gulfstream on April 29. 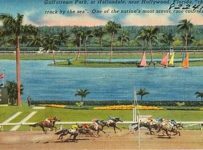 The 6-year-old gelding won in a fast 1:40.43 on a course listed as firm. Edgar Prado, who rode Thinkinquality on April 29, is now riding at Pimlico in Baltimore. Trainer Sandra Slivka has given the mount to Eddie Castro for the Wednesday opener. Cornelio Velasquez will ride Aethon (program number 6) for trainer Steve Klesaris. 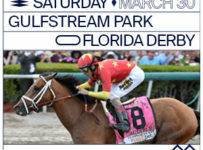 It will be Velasquez’s first race in the Gulfstream spring meet, after relocating from Belmont Park—with a plan to ride year-round in South Florida. 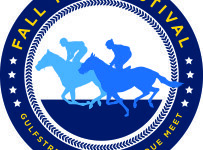 Velasquez also has mounts in Wednesday’s fourth, fifth, sixth and eighth races. His career honors include being leading rider in wins four times at Calder Race Course. 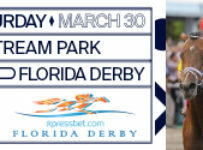 *Third race – 5 furlongs turf; $35,000 maiden claiming, fillies and mares 3-YO and up. It is the start of the Rainbow 6 with a carryover of $169,793. 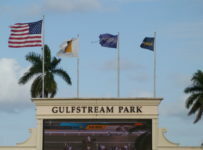 Details may be found in a story “Gulfstream Resumes Racing on Wednesday” posted on Tuesday May 31 on our blog. Russian Greek is the likely favorite in a six-horse field in the day’s feature, and could be a horse to single in the Rainbow 6 and Late Pick 5. 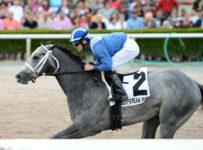 A stakes veteran, he is coming off an impressive win at one mile on dirt in a $30,000 optional claimer at Gulfstream on April 27. Russian Greek took an early lead and coasted to a 6 ¾ length win over Master Blender, who is not in today’s race. His winning time was a solid 1:36.09 on a track listed as fast. Emisael Jaramillo has the return mount for trainer Efren Loza. Russian Greek is a 7-year-old non-gelded son of Giant’s Causeway. His record includes a victory in the 2012 California Derby at Golden Gate Fields. 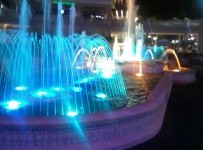 The April 27 race was Russian Greek’s first in 2016. 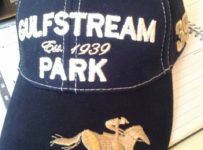 In 12 starts last year, a mix of dirt and turf races, he had three wins and three third place finishes. Owners Rachel Jacobson and Dominick Auricchio have Russian Greek in for the $25,000 tag. 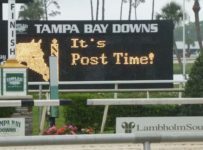 It will be interesting to see if there are any takers for a 7-year-old with back class who might need just two races for a new owner to recoup the claiming price. Russian Greek has shown ability to rate off the pace, as well as win from the lead. The top threats today could be Chepstow, breaking from the outside post with a history of some early speed, and Hy Kodiak Warrior, who is dropping in class, and usually runs from off the pace.